Power company NTPC’s mega order for equipment is stuck in limbo. It has been unable to acquire land for some of the intended projects. The three projects in question are Lara in Chhattisgarh along with Darlipalli and Gajmara, both in Orissa. NTPC’s proposed projects have a capacity of 4,000 MW each. Typically, one megawatt requires one acre of land. Switching gears, Tata Motors is offering a free upgrade for Nano cars. The company is offering to replace the starter motors on older Nanos with the new 2012 version. 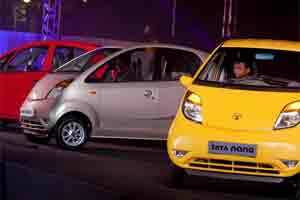 Tata Motors launched the 2012 edition of the Nano in November. The company insists the upgrade is not due to any safety concerns. But last month it had offered Nano customers the option of retro-fitting a safety feature after some cars caught fire. Large NTPC order is stuck in limbo; Tata Motors offers free upgrade for Nanos; markets begin the week with gains. And finally, Indian markets shot up on Monday, gaining more than other Asian bourses. Investors snapped up shares amid expectations that RBI would cut its cash reserve ratio early next month. The Sensex surged 232 points to 15,971. And the Nifty climbed 65 to 4,779.